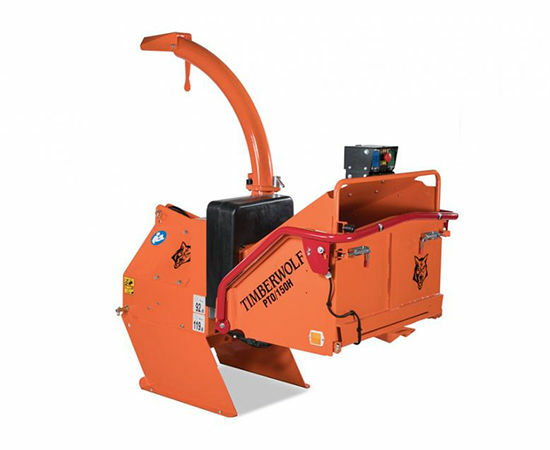 The Timberwolf TW PTO/150H with emphasis on exceptional crushing power gives the ultimate chipping efficiency, perfect for landowners, estates and golf clubs. 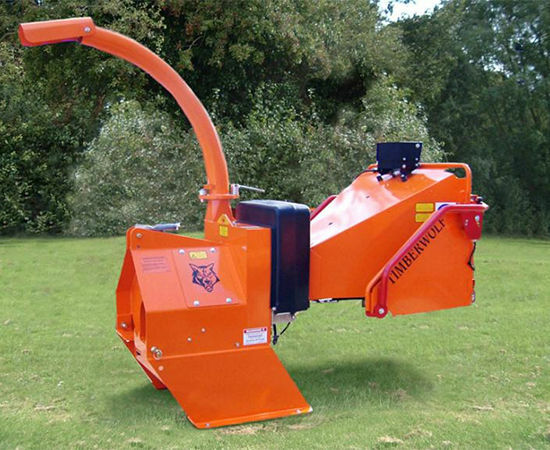 This PTO chipper with self-contained hydraulic system delivers a superb chipping performance. The TW PTO/150H chipper will fit onto any tractors fitted with a 6-spline 540rpm PTO shaft, Category 1 linkage and a 12 volt 7 pin lighting socket. The fully self-contained hydraulics prevent any cross contamination of oils or any pressure issues. The TW PTO/150H is ideally suited to tractors from 25hp to 60hp. 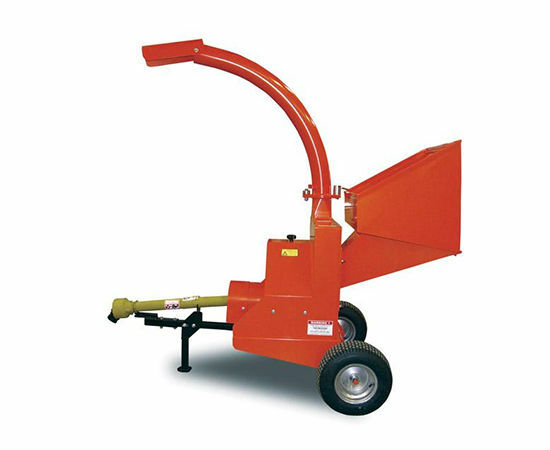 This chipper will easily tackle branches from 125mm (5”) to 152mm (6”) depending on tractor horsepower. The sleek design of the TW PTO/150H is a perfect match to sit behind a compact tractor and short enough to manoeuvre with ease. 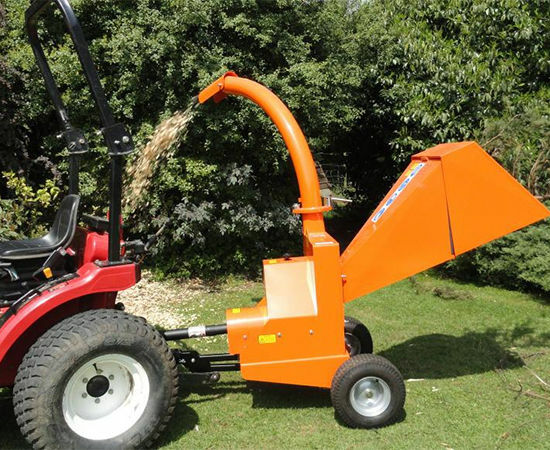 This is a versatile 4” chipper for a council, golf course or farmer, suitable to work with any small tractor or power unit (18-40hp). With a low centre of gravity, easy tow chassis and good ground clearance this machine has a positive blade feed action and large feed funnel as well as the ability to quickly process 75mm to 100mm (3”- 4”) diameter material at up to 1.5 tonnes per hour. The PTO/100G has been designed for use by the medium to large estate and landscape gardener has access to a compact tractor with a 6- spline 540rpm power-take-oﬀ shaft. Ideally suited to tractors from 18hp to 40hp, it will easily tackle branches from 75mm (3”) to 100mm (4” diameter) depending on tractor horsepower. The machine is ﬁtted to a ‘slow speed’ chassis and does not require the use of the three-point linkage. 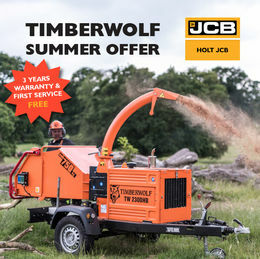 Holt JCB is bringing you a fantastic deal on selected Timberwolf wood chippers this summer, valid until 31st August 2018.